"84-"90 Colt vista FWD: Rear disc swap info [and my brake upgrade]. Post subject: Re: "84-"90 Colt vista FWD: Rear disc swap info [and my brake upgrade]. I got the rear calipers and rotors installed. and I confirmed that all 8 stainless brake hoses that came with the 3SX kit are needed on the vista, and all work, but I had to bend the stock hard line that used to go into the rear drum cylinder, but it was not that hard, I plan to add some mounting tabs to hold the lines to the rear subframe better, right now they are routed away from anything dangerous but for peace of mind I'll go back in there later. So here is the recipe for making a better brake setup for the early fwd wagons: I don't recommend 1st gen vista owners do this all at once, I'd start with bigger rims and new tires that clear the bigger brakes, that will help all over the place, more rubber to hug the road and better handling and ride quality then the oem 13'' inch rims that came with these wagons. 0: larger at least 15" inch rims, to help clear the large 2 piston front rotors, I used the rims from an OZ rally lancer 4 lug. 1: 3SX stainless brake line kit designed for a fwd "91-"99 3000GT SL/Stealth Base model. 2: "90-"94 Mitsubishi eclipse Turbo [AKA 1G DSM] brake master cylinder. 3: "91-"99 3000GT/Stealth N/T fwd 2 piston calipers/brackets, new brake pads/hardware. 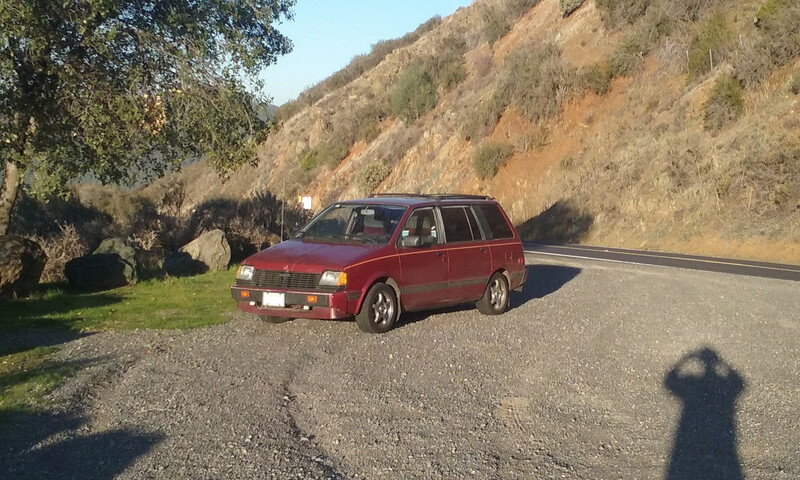 5: "91-"95 [2nd gen vista/ expo/ summit wagon] 4 lug hubs because I wanted to keep it 4 lug [for 5 lug use DSM front hubs]. 6: "91-"92 6th gen Mitsubishi Galant vr4 front rotors for 4 lug [for 5 lug use dsm front rotors]. 7: "83-"89 5th gen Mitsubishi Galant 2.4 model, rear rotors/hubs; calipers/sliders/new brake pads/hardware; caliper mounting brackets; dust shields; parking brake cables, with all mounting tabs and clips; brake proportioning valve. Something thats worth noting is "90-"94 1g dsm rear calipers are the same as 5th gen galant calipers, so you can use them in place of them. In conclusion, all of this makes a big difference on stopping power, I felt a noticeable difference over the stock drums, I still have to do an alignment, but honestly this is among the best mods I have done on this wagon, and honestly speaking, If you at the least put the bigger front calipers on that will make a great impact on emergency stopping power, and these wagons can use all the help they can get in that department, still have not installed the proportioning valve from the all wheel disc 87 galant yet, but thats in the works along with a possible way to mount the evo/3rd gen eclipse 1 1/6 bore brake master, I think I have found a way to rig one up to work with the remote mounted 1st gen vista reservoir, I pulled some seals and ports from a 2g 420a eclipse along with the plastic locking retainer that will need some light mods to get it mounted on the 1 1/6 bore brake master, but seeing as how I have come this far I'm sure Its not that hard to accomplish.